As my previous post, there are so many twitter icon and button resources. And the next question is how to put twitter button on my blog? There are many ways to do this. But if you want the fast and simple way, you can use this free twitter icon service. 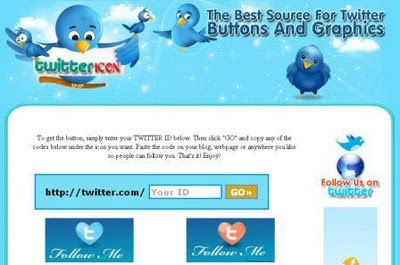 This site offer up to 176 twitter icon. g punya IE 6 si..
Templates are your biggest time saver and your easiest way to standardize. You already probably use templates and don't even realize it. When I started my blogs I did a lot of search and research on this and collected a big list of good sites (more than 250 sites) that offer decent unique free blog templates. If you are interested take a look at the below link. Jadi pengen pasang widget twitter lagi di blog nih...!!!! Oi gostaria de fazer parte do seu blog. Informatif... I wanna follow you, May I? informatif, but i have not twitter. Thanks for the great selection of Twitter buttons for our sites and blogs. This an interactive joke, wholesale Cartier jewelry so have a piece of paper and pen handy. A blonde woman walks into an auto parts store and the parts man asks how she is doing and what can he do for her. She classic designer jewelry replies, "Fine, I need a seven-ten cap for my car." The man asks," A seven-ten cap? Where does it go, I've never heard of such a thing?" The blonde angrily replies, "It goes silver jewelry on top of the engine and don't think just because I'm blonde I don't know what I'm talking about!!" Perplexed, the parts man asks if she would draw him a picture and maybe help him out in figuring out what it is she needs. Reader: Draw the number 710 in the middle of the paper and draw a circle around the whole number. Now turn the paper upside down. This is very nice twitter blogger and more fantastic blogger so that can be enjoy it in this blogger. Often are used and enjoy it in this blogger.Mostly people are very like it.